Join Herbalist Michelle Bernardi of Nettle and Hive for a special workshop to support new parents. She says "We’ll talk about the 4th trimester, the months following childbirth, postnatal. Not spoken about nearly enough, this is a very vulnerable time for the new mother. We know the importance of nutrition, health and support during the 9 months of pregnancy, however, this is lacking for mom after baby’s arrival when she is the most fragile. Women are very strong and capable creatures, but we also tend to underestimate the need to ask for support and have a hard time receiving (which in the end make us stronger). 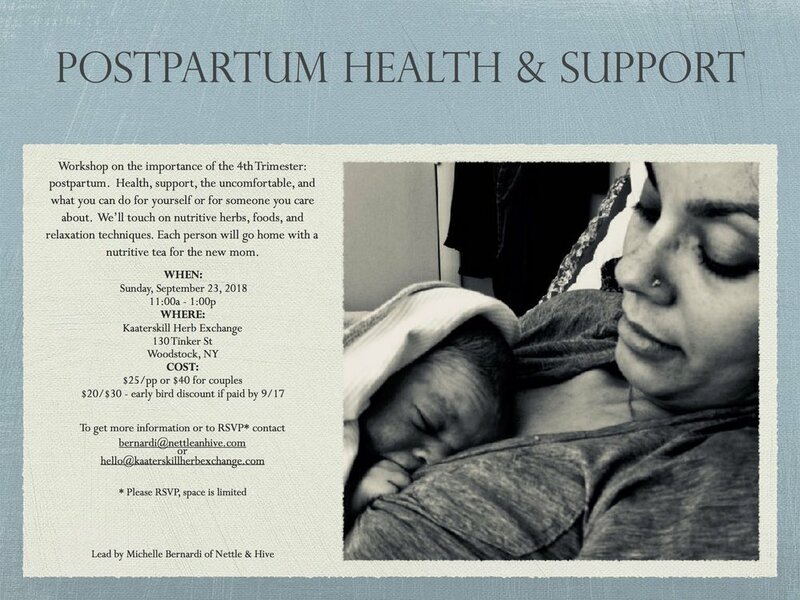 I’ll discuss postpartum health, support, the uncomfortable, and what you can do for yourself or for someone you care about. I will touch on nutritive herbs, foods, and relaxation techniques for the new mom." All participants will go home with a nutritive postpartum tea blend. Or, Email Hello@kaaterskillherbexchange.com or bernardi@nettleandhive.com to sign up!